Feb. 13, 2019, 1:21 p.m.
Is it not possible that the US aims to make Venezuela capitalism-friendly using typical CIA "methods" AND that Maduro is illegitimate? I have no reason to trust America's intentions in South America, but I don't trust Russia and China in this regard either. Maduro's government is a total disaster and he has obviously subverted democracy to win the election. I know your default opinion is whatever Russia supports but that election is highly suspect. From what I have seen it is difficult to pull off a second term when people across your country are starving, so I have my doubts that a halfwit like Maduro pulled it off. I'm sorry but this is NSMB and sentient alternate opinions are simply not allowed. Feb. 13, 2019, 7:55 p.m.
Maduro is illegitimate? ....he has obviously subverted democracy to win the election. I know your default opinion is whatever Russia supports but that election is highly suspect. From what I have seen it is difficult to pull off a second term when people across your country are starving, so I have my doubts that a halfwit like Maduro pulled it off. There was nothing wrong with that election. You are a dupe of the cheerleading coroprate media (and seemingly dismiss out of hand any other narrative) if you think there was. Note that most of peeps in above vid are some form of coloured, indigenous, hispanic, black, and are the majority and represent the lower stratas on the economic ladder. The "opposition" on the other hand, are directed by the oligarchy who are mostly of Europeon stock, white, and overly represent the wealthy in country. You seem to dismiss the former. Are you classist chup, or just racist? IF that portion of the "opposition" that boycotted the election had not, then the oligarchs actually might have won. But instead they decided to sing from the songsheet of the CIA and do away with the niceties of democracy and now they've no other choice than to sleep with the devil. I hope they burn! Yah ya ya chirp chirp chirp god you're predictable! .... I only root for the Russkies insomuch as they are a fly in the buttermilk of Amerikan hegemony. My "support" of Russia/Putin is more nuanced than you'll admit because it's easier to bash me otherwise. Last edited by: tungsten on Feb. 13, 2019, 8:57 p.m., edited 6 times in total. Feb. 13, 2019, 10:11 p.m.
Feb. 14, 2019, 12:36 p.m.
[T]he U.S. intends to fabricate a humanitarian pretext in order to launch a military attack on Venezuela and, by resorting to intimidation, pressure, and force, is seeking to introduce into this sovereign nation's territory alleged humanitarian aid... It is obvious that the United States is paving the way to forcibly establish a humanitarian corridor under international supervision, invoke the obligation to protect civilians, and take all necessary steps. It is worth recalling that similar behaviors and pretexts were used to by the U.S. during the prelude to wars it launched against Yugoslavia, Iraq, and Libya, which resulted in tremendous human losses and caused enormous suffering. Last edited by: tungsten on Feb. 14, 2019, 10 p.m., edited 7 times in total. I actually never mentioned the election, I said he has subverted democracy which is the plain truth. I also said that I am fully aware that the US messes with other countries leadership and both can exist in the same universe, so you are just setting up a strawman. You, my friend, are predictable. If Russia supports it, so do you. Why I don't know, but it could have something to do with your belief that the "mainstream news" always lies. Of course, that must mean that Putin, Jinping, and Erdogan are valued sources of truth. 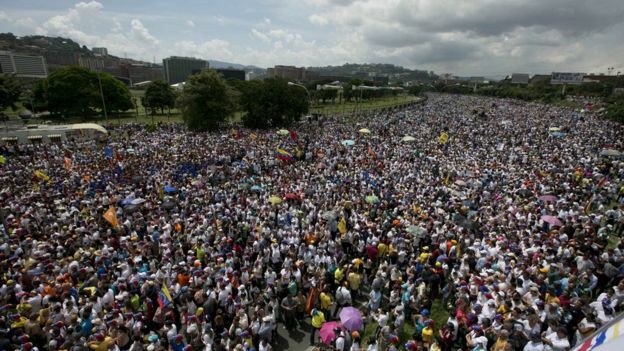 So that is great that there was a line of tens of old people that love Maduro. Cool story bro. Last edited by: chupacabra on Feb. 15, 2019, 9:29 a.m., edited 1 time in total. Feb. 15, 2019, 9:56 a.m. This is why you are a fool. You hold America to a high standard, as we all should, but you don't hold the opposing forces to any standard whatsoever and you are blind to the fact that despite its flaws, western media is the freest in the world. Maduro dissolved the national assembly which is what dictators do to stay in power, but you just assume he would hold fair elections?. Why? What in his past would make you believe that? He is fully corrupt and nothing the west does changes that fact. American bad guys could be in the streets with CNN right now claiming the country actually wants Geraldo Rivera to lead them, but that doesn't change the FACT that Maduro/Chevez have been a total disaster to the country. People are leaving in the largest mass migration on the planet, and it's not because of Canada. Feb. 15, 2019, 1:53 p.m.
Maduro did not disolve the NA, the SC disolved the NA as per the constitution because the "opposition" was sabotaging parliamentary procedure. There are times when truth can be found between the lines of western "media", but recently it's just full on sophomoric propaganda, much like the run up to the Iraq war crime, to which the CBC has shamefully been party. A Canadian passport will soon be a object of scorn. You have no idea what standard I hold them to because its never been dicussed. Try again. Maduro/Chevez have been a total disaster to the country. Economic/psychological/propaganda war waged by the psychotic yanke scum against a country struggling to free itself from class oppression created this tragedy, not patriotic Venezuelans. Last edited by: tungsten on Feb. 15, 2019, 1:58 p.m., edited 1 time in total. Feb. 15, 2019, 2:11 p.m. I propose that the denizens of NSMB set up a go fund me campaign to send both of you to Venezuela to get us the truth about what's actually going down in the greatest failed oil state the world has ever seen. Feb. 15, 2019, 3:02 p.m.
the greatest failed oil state the world has ever seen. Alberta? You sending them to Alberta? ....I hear Moscow is nice this time of year. Yo Big T. What do you think of Navalny? Feb. 15, 2019, 6:03 p.m.
Last edited by: supersmash2 on Feb. 16, 2019, 10:27 a.m., edited 1 time in total.